If you are driving towards Four Corners on Route 160 you’ll see signs for Dinosaur Tracks near Tuba City along the road (just before you reach Tuba City, heading north). These dinosaur tracks receive 4 out of 5 stars on both Trip Advisor and Yelp, and if you search online to find out if these are real, you’ll find that people generally agree these are real dinosaur tracks. They have been viewed and verified by paleontologists from Northern Arizona University (NAU), as well. The hike is fantastic, and I highly recommend making the stop. 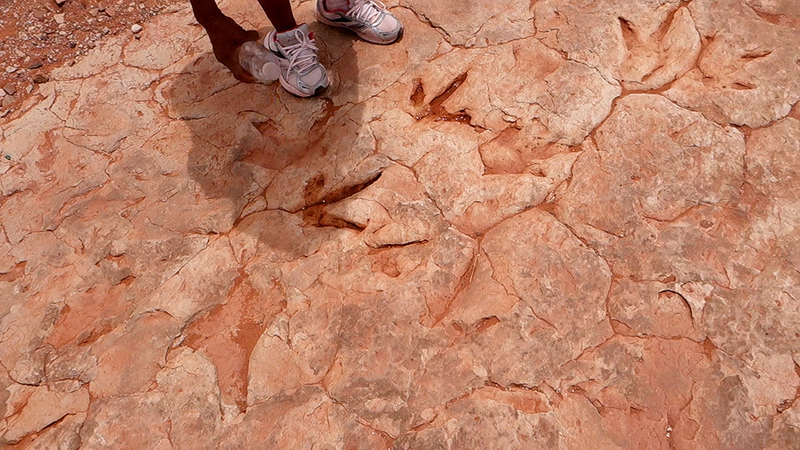 You’ll quickly find that there are hundreds of dinosaur tracks and that the view is fantastic. You’ll see the Hamblin Ridge, and get a glimpse of a barren desert land. 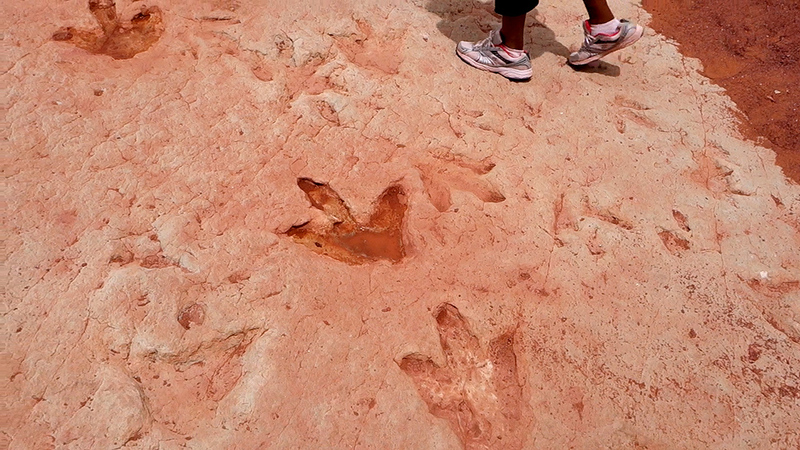 Here are some of the dinosaur tracks. This can’t really be called a hike, since it only takes about 15 minutes to view all of the tracks and the elevation is essentially flat. Despite what your tour guide says, there are apparently no actual Tyrannosaurus rex tracks at this spot. Yeah, I know, disappointing. Oh, and the “skeleton” that is pointed out to you along your walk is also not real, but is actually just an interesting place where the sandstone eroded. Also, the “tooth” that you’ll see along your walk is apparently not a raptor claw, but is instead most likely a lung-fish gill-plate. That’s according to a site called hikearizona.com which has this excellent review of the site. 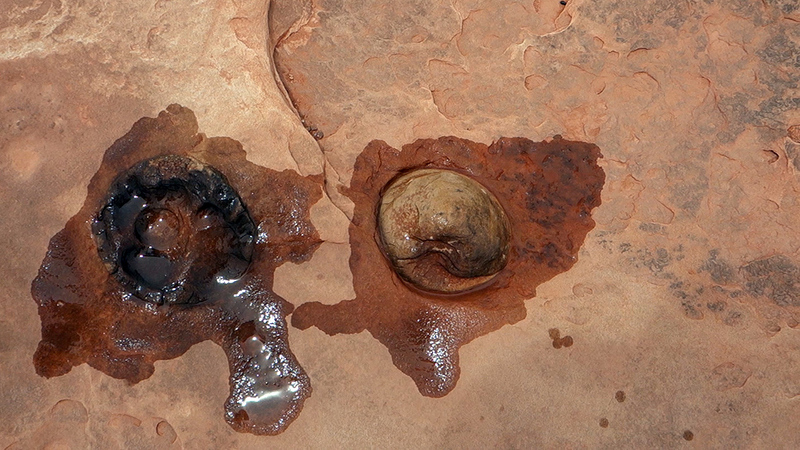 Here’s a photo of the “dinosaur poop” set in the shape of a turtle. 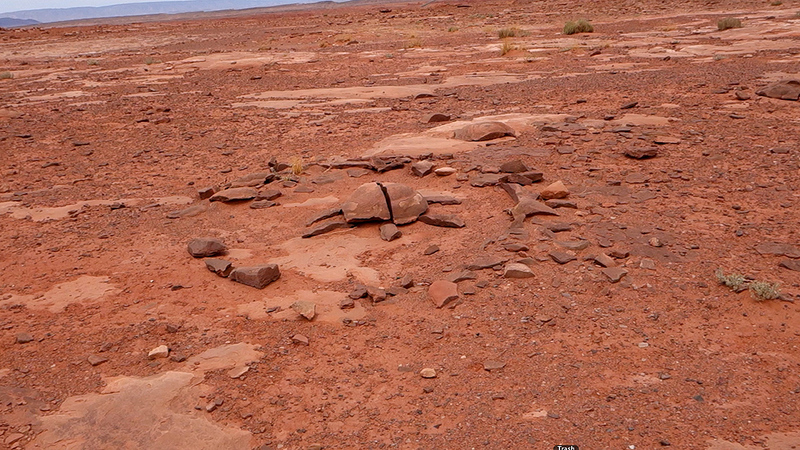 You should know that this is open land, not owned by anybody (but it is on the Navajo Reservation). When you park, you’ll be greeted by someone who will inform you that there is no fee to park, or to view the tracks, but that they will give you a guided tour. I’ve included my video above showing the tour, and we gave the lady a $16 tip for her time. You should know that you are not obligated to take a tour, and can walk around the area yourself freely, and parking is also free. We took my son there back in 2003. I remember doing the tour ourselves and giving $10 per person, but was followed back to our vehicle by a guy who was asking very persistently for more money. I didn’t think it was worth more than $30 for the few tracks that were there, so he didn’t get anything else. It sounds like things have not changed, they are still harassing the tourists. Yeah, I think it depends on who you get to give you the tour. I understand you can turn down the tour, and just walk around if you wish. my family visited here in 1999. Our guide was very nice and my boys loved seeing the dinosaur tracks. I gladly paid for our tour. Please remember these people live below the poverty line in a very isolated area. There aren’t many options for earning a living. We actually visited this site back in 1997 we were greeted by a young Navajo man called David , he politely gave us a nice tour of the tracks and was also very interesting to talk to about his culture . My 5 year old son was awestruck as he was a dinosaur freak at the time . When the tour was over David again politely asked if we enjoyed the tour and asked could we make a small payment for his time . I gladly paid $20 for his time as it made that part of our US tour a great experience . As Australians visiting the US at the time we came to see how hard it can be for the native Indians to keep their culture going in face of so much change and outside pressures . 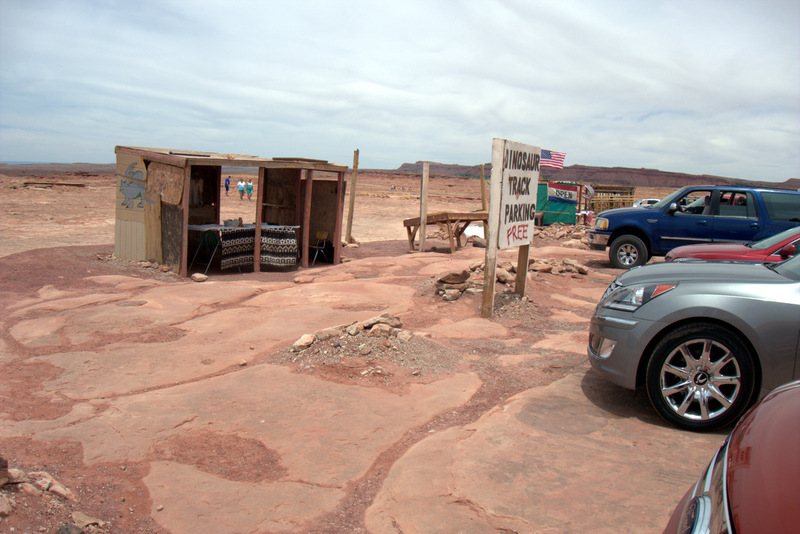 We stopped there on our way to Monument Valley yesterday. They didn’t ask for money. We were given a nice tour. We bought a couple things because we felt his time was worth it.